The Duke and Duchess of Sussex are in Ireland on their first foreign trip since they got married in May. PRINCE HARRY AND Meghan Markle are continuing their trip in Ireland today and there are two chances for members of the public to catch a glimpse of the honeymooners. The couple met Taoiseach Leo Varadkar on a visit to Government Buildings after they landed in Ireland yesterday. During the brief meeting the Taoiseach and the Duke discussed family, rugby and the weather. Today the Duke and Duchess have a packed itinerary which includes a meeting with President Michael D Higgins at Áras an Uachtaráin and a walk around Trinity College where they will see the Book of Kells. They will also visit Croke Park, where they will see exhibits – including artefacts from the Bloody Sunday massacre – and will watch hurling, camogie and rounders being played. They’ll also have a chance to talk to the players while there. The couple will visit the Famine memorial and EPIC- the Irish Emigration Museum – at the CHQ building on Dublin’s Custom House Quay. 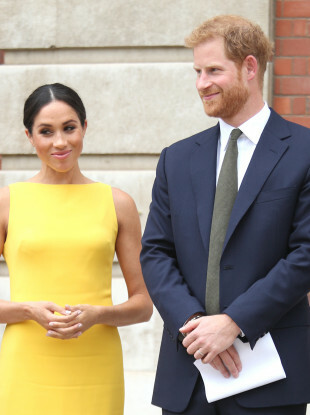 While there, it is understood that Markle will have a detailed family tree of her Irish ancestry presented to her. People who want to see the couple will have opportunities to do so at both Trinity College and the CHQ building. The pair is due at Trinity in the late morning and people can enter the college from 10am via the Nassau Street entrance. Harry and Meghan will later do a short walkabout outside the entrance to the CHQ building in the afternoon. Public access to the engagement opens at midday and entertainment will be provided by students from the British and Irish Institute of Music. Organisers are warning that space is limited at both of the engagements and people will be admitted on a first come-first serve basis. People planning to attend are being advised that they may be standing outside for some time so they should bring water and sunscreen. There will also be security checks so Gardaí are advising people to come with minimal personal items for easier access. Email “If you want to see Meghan and Harry today here's where you can go”. Feedback on “If you want to see Meghan and Harry today here's where you can go”.